Review: “The Wise Kids” tells the story of three teenagers who are about to leave their hometown in South Carolina to enter University. All of them are members of a youth group in a Baptist Church and are struggling with their faith in different ways. Brea is a sensible girl, who became restless about her beliefs; Laura needs constant attention, being an example of Christian devotion; Tim is openly gay and very conscious of what he wants. Their families appear just enough times for us to perceive the kind of atmosphere they are experiencing at home. Strangely, the conflicts among the characters are brief; the scenes flow from one to another with a sort of lightness without emphasize the arguments. Tension is presented more as an interior struggle through questions and doubts, or expressions of unhappiness and discomfort. 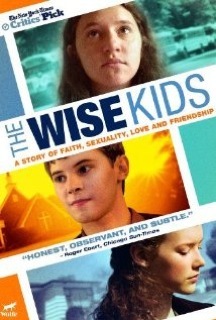 “The Wise Kids” chose a graceful approach to connect sexuality and faith issues in a sincere and intelligent way.